Yesterday I was up to it again. Yes... I was taking something thrifted and turning it into treasure. I regularly rummage through our recycling bin to find treasures for the kids to decorate or transform. I collect odds and ends from things just in case I might need them later. I never see worn out clothes as trash. They are potentially fabric and snaps and zipper for something else. 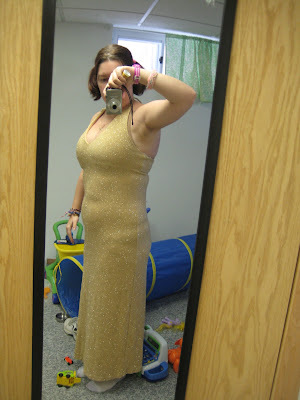 And turned it into a pretty dress for a Pre-Oscars Red Carpet Fashion Massacre party that I am going to today. When I start to feel that itch - you know - the "I wanna make something out of something else" itch I like to turn to Favecrafts. My favourites posts to read are the lists of upcyling/recycling projects that they come up with. Like this one that features 8 things to do with old sweaters. It even features Sweater Boots! The second most popular upcycling project I have posted on the blog? This baby! :D My Ultimate Scrapbuster rug. Made mostly out of scrap knits - from t-shirts for example. Favecrafts has a list for that as well: Ten Ways to Repurpose Old T-Shirts. Their lists are a fantastic resource for inspiration. Go over there and check 'em out if you haven't already. They also have an awesome newsletter to round up all of their exciting stuff in one place. Note: I wasn't paid to do this feature - I just really like this site.